We expect a lot of teams this year. Team network for team N is: 10.A.B.0/24, where A = 60 + N / 256, B = N % 256. If it seems difficult, just enter a team number to see instructions for your team. This year we provide the hosting for your vulnerable image on our servers. 0. 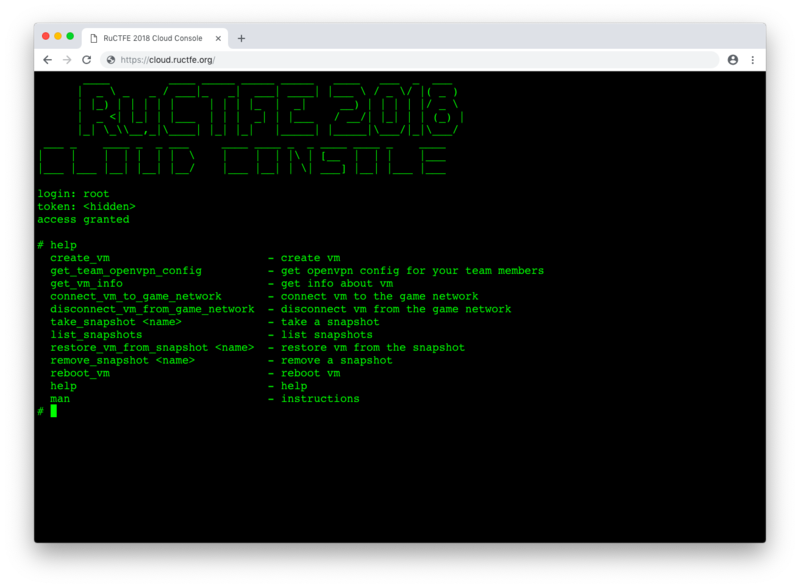 Enter to the cloud web console, https://cloud.ructfe.org. The interface will be opened at 10 Nov 2018 10:00 UTC. 6. If you had non-cloud setup, shut down the openvpn client on your game router. Now other teams and checksystem are able to access the vm. 8. Have a nice game! The next steps are required only for non-cloud setup, but we still recommend to follow them just in case. Check router image settings. Go to: "Settings->Network->Adapter2". Make sure that it is bridged to your real, hardware network adapter. It is preferable to use Ethernet adapters for bridging rather than Wi-Fi adapters. Check test image settings. Make sure that Adapter1 is bridged to your real network adapter. Start both virtual machines. You will see some instructions on a logon screen. eth1 - this is your internal interface. It should be automatically set to: 10.A.B.1. eth0 - it should be automatically set to: 10.A.B.3 and gateway: 10.A.B.1. Follow the instructions sent on your PoC email (if not, please send message to: info@ructf.org) to obtain your OpenVPN config. Copy the config to /etc/openvpn/*.conf (for example to /etc/openvpn/ructfe.conf). Restart OpenVPN on your router (service restart openvpn@ructfe if your confing has name ructfe.conf). Leave both images running. You can shut down your testimage when the game starts.